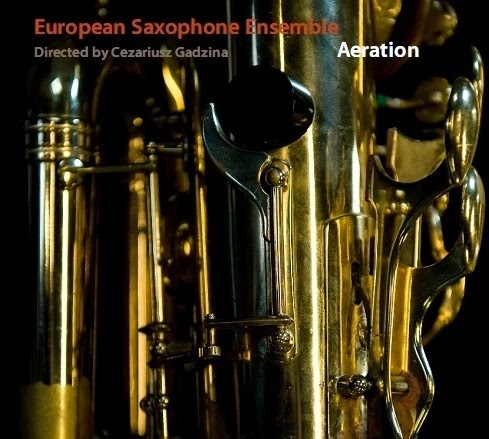 When twelve saxophone players from different countries in Europe sit down to combine their different cultures, languages, and love of all things saxophone the result can only be this album. This album is a split between classical and jazz and features some of the best jazzy improvisations of any saxophone ensemble I’ve ever heard. Firstly you as a listener should know that the album is 75% classical and more specifically modern classical music. Generally I don’t review classical saxophone music as there is very little focused around the baritone or bass saxophone but this album enough of both horns to create a fun listening experience. Secondly, this album is a live album and it done so well that short of the applause you’d be surprised that it’s not a studio album. It really shows the level of musicianship within the group. Like most people who learned saxophone from a young age I learned to play by playing classical music. most of that was transcriptions of classical pieces for other instruments. By the time I had moved to music specifically written for the saxophone I was in high-school and preparing for contests. This continued in to college but never really resonated with me a musician. I still enjoy the advanced techniques and unique tonality of modern 20th/21st century saxophone music but I don’t actively seek it out. I still enjoy practicing the Denisov Sonata and Noda Improvisations to keep my musicality and classical senses sharp but they get short shrift to practicing bebop and scale extensions most weeks. With that in mind I did spend quite a bit of time enjoying the piece Sassofonissimo: by Jordan Goshev but it wasn’t until I got to the last 3 tracks that my ears perked up and I heard how hard this group can swing. The best part for my ears is their use of the baritone and bass saxophones. In this album the baritones are a powerful voice and add texture to the round bass tone. The blends are the stuff of low saxophone legend. At times it’s hard to hear where the bari begins and the bass ends. Yet at other times the bari’s are playing a tight soli line leaving the bass to hold it own as the solo low horn. It’s during this time that you hear just how valuable a bass saxophone is to a saxophone ensemble.For a great exposed sample of François-Xavier Caillet’s bass tone listen to track 9 titled Memories at about 3:00. He has a full and powerful tone which is clearly an ensemble friendly tone as compared to Colin Stetson’s solo tone or James Carter’s bass tone. His tone is one to be emulated by any ensemble bass saxophone player. This album makes me want to start a saxophone ensemble, purchase a bass saxophone, and play jazz standards, and music by Percy Grainger. I’ve always had a soft-spot for Grainger’s compositions. TAKE AWAY: The last three tracks of this album are what ultimately sold me on the album and is why I am recommending that you the listener own it. More than anything i would love to hear this group play more jazz. They have the orchestration and the skill to make amazing and unique jazz tunes.